The Carrier Pigeon, a 175-foot long clipper ship with a gilded pigeon as her figurehead, was launched from the shipyards at Bath, Maine in the fall of 1852 and left Boston on January 28, 1853 for her maiden voyage around Cape Horn to San Francisco. On the morning of June 6, the vessel was spotted off Santa Cruz, but visibility worsened and shrouded the ship in a thick blanket of fog as the day progressed. That evening, the captain, believing he was a good distance from land, steered his vessel shoreward. Before land was sighted, the Carrier Pigeon struck rocks and quickly began taking on water. The captain and crew made it safely to shore, but the ship was a total loss. After offloading a good portion of the supplies, the vessel, valued at $54,000 and still stranded on the rocks, was sold for $1,500. Since the time of the wreck, the point of land closest to the rocks that claimed the Carrier Pigeon has been called Pigeon Point. Previously, the point had been known as Punta de las Ballenas (Point of the Whales), as a whaling station was located nearby. Pigeon Point’s 115-foot tower shares the title of tallest west coast lighthouse with California’s Point Arena Lighthouse, and is similar in design to those at Bodie Island and Currituck Beach in North Carolina, Morris Island in South Carolina, and Yaquina Head in Oregon, though the heights of the towers differ. The first-order Fresnel lens used in Pigeon Point Lighthouse was manufactured in Paris by the firm of Henry Lepaute and is made of 1,008 separate prisms. Revolving at a rate of one revolution every four minutes, the lens’ twenty-four flash panels produced a characteristic of one flash every ten seconds. 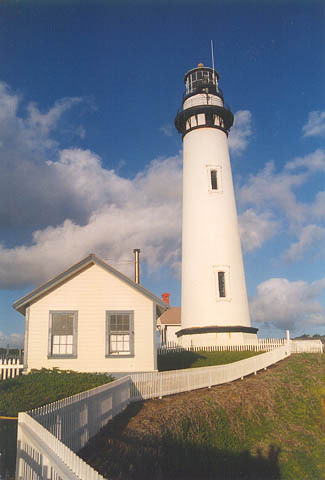 The jewel-like lens was not introduced to lighthouse service at Pigeon Point. It first served in Cape Hatteras Lighthouse (an older tower, not the current one) until it was removed from that tower, placed in storage at the General Lighthouse Depot on Staten Island for a few months, and then shipped to Pigeon Point on August 11, 1871. The small building attached to the base of the tower contains an office on one side and an oil storage room on the opposite side of the central hallway. In 1909, a separate oil house, which now contains informational displays, was built away from the tower as a safety measure for storing the volatile kerosene fuel that was introduced as the illuminant in 1888 in place of lard oil. A new boiler was installed in the fog signal building in 1881, and to protect it from “some substance destructive to boiler-shells and tubes” that was found in the water obtained from the station’s spring, the construction of a water collection basin and cistern was ordered. Two 4,500-gallon tanks were put up near the fog signal buildings, and a water shed with an area of 20,000 square feet was laid in the station’s nine-acre lot to collect rainwater. A new fog signal house, the one that remains standing today, was completed in 1900. As the original quarters were rather confining for the station’s four keepers and their families, a large addition was completed in 1906 to provide four additional living rooms and four bathrooms. One can only imagine that the mothers at Pigeon Point and other lighthouses were always anxious regarding the safety of their children, whose yards were so close to the ocean. In October 1878, one mother’s heart was broken when five-year-old Stewart Munroe, son of Assistant Keeper John Munroe, fell over the bluff and into the sea while playing with another child near the lighthouse. Only the child’s hat was immediately found, and the distraught parents offered a reward to anyone who recovered the body. Jesse Mygrants requested a transfer from Point Arguello to a station where his daughters could attend school. 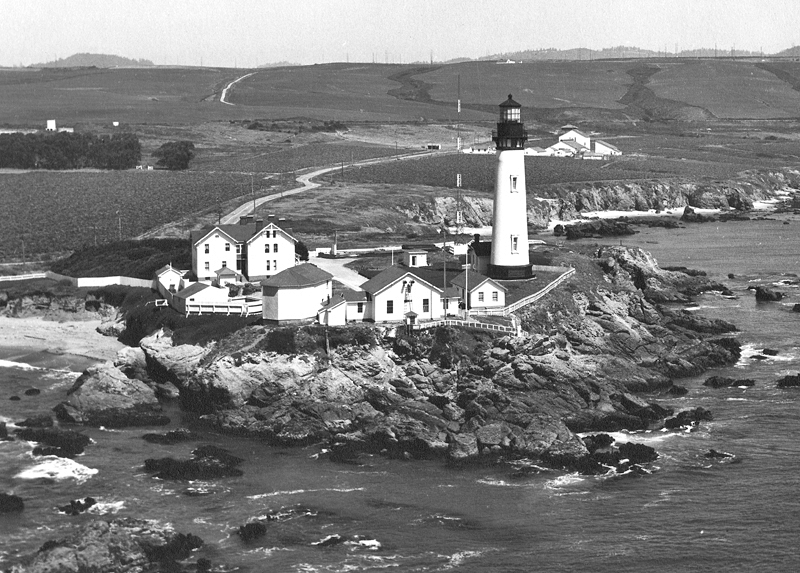 The Lighthouse Service complied and assigned him to Pigeon Point in October 1924. One of these daughters, Jessie, recalls her father helping her with homework at a small desk in the watchroom as the giant lens slowly rotated just overhead. In the spring of 1933, Mygrants and the other keepers were using blowtorches to remove old paint from the exterior of the Victorian dwelling when Jesse noticed that one of the nails in the dwelling remained hot long after the removal of the blowtorch. Putting his ear to the wall, he alarmingly heard the crackle of fire. Smoke soon started to issue from the dwelling, and its many occupants began scurrying to remove their prized possessions. The keepers bravely fought the fire until a fire truck summoned from Redwood City reached the station in a record forty-five minutes – a mighty fine time even with today’s improved roads. The damage from the fire was limited to the eastern side of the dwelling, that used by the Mygrants, and though they were inconvenienced for some time, a crew of workers patched up their apartment during the summer. 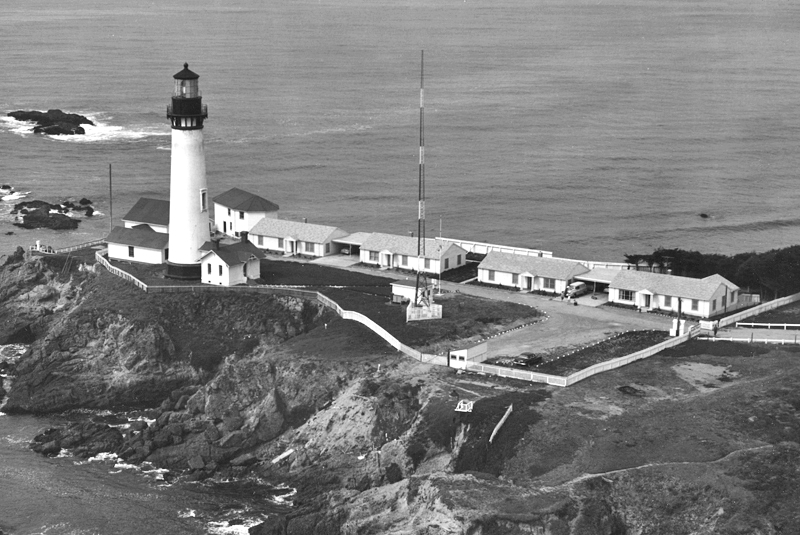 A radio antenna, which emitted a Morse code signal unique to Pigeon Point, was erected near the tower in 1943. The radio signal was eventually synchronized with the fog signal so that a mariner, by measuring the delay between receiving the radio signal and hearing the fog signal, could calculate his distance from the point. Before synchronization of the signals, a ship would use radio signals from multiple stations to triangulate its position. The audible fog signal was discontinued in 1976, when modern navigational aids made it unnecessary. In 1960, the original fourplex, though still in good condition, was razed, and four ranch-style houses were built by the Coast Guard, in what one must admit now was clearly an aesthetic compromise. A rotating aero-beacon was placed on the balcony outside the lantern room in 1972, and the Fresnel lens was deactivated. This move, allowed the station to be automated in 1974. In 1980, the four generic houses were leased to American Youth Hostels, Inc., for use as economical, dormitory-style accommodations. In 2000, just as the Lighthouse Inn, a bed and breakfast located adjacent to the lighthouse property, was nearing completion, the Peninsula Open Space Trust purchased the inn and surrounding property. The inn was promptly dismantled, and the property returned to a natural state. Thanks to this “undevelopment” project and other purchases by the trust, the area around Pigeon Point Lighthouse should remain in a natural state for years to come. Two large sections of a brick and iron cornice located high atop the tower fell to the ground in December 2001, prompting the closure of the tower and the area immediately around its base. The following year, the lighthouse was listed for transfer under the National Historic Lighthouse Preservation Act. California State Parks and Peninsula Open Space Trust filed a joint application for ownership of the lighthouse and received the National Park Service’s recommendation in 2004. 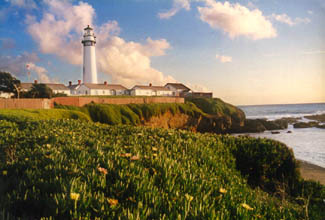 Two non-profits appealed the decision, but Pigeon Point Lighthouse was officially transferred to the state in May 2005. The California State Parks Foundation is currently spearheading a multi-million dollar fundraising campaign, in partnership with State Parks and the San Mateo Natural History Association, to restore and reopen the historic Pigeon Point Lighthouse. In the summer of 2011, California State Parks announced that thanks to a $175,000 grant from the Hind Foundation the first phase of restoring Pigeon Point Lighthouse would begin later that fall. 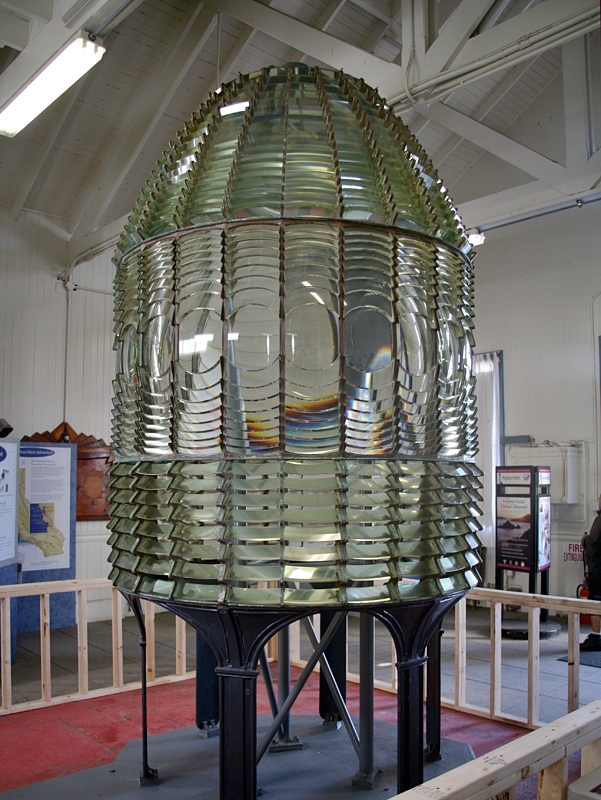 The first-order Fresnel lens was disassembled and removed from the lantern room on November 12 and 13, and then cleaned and reassembled in the fog signal building, where it is now on display for the public. The $325,000 first phase of the restoration also includes coating iron on the tower with rust inhibitor, repairing broken windows, and some other repair work. 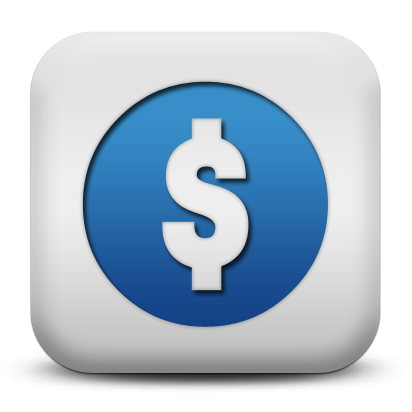 A complete restoration of the tower, estimated to cost $11 million, will occur when additional funds have been raised. 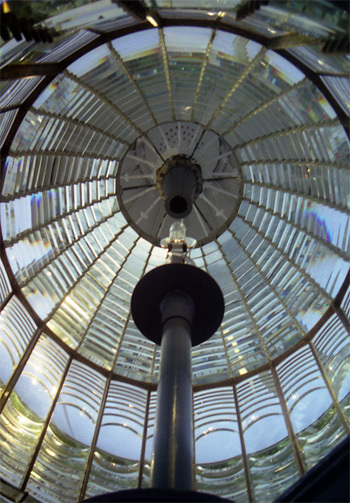 The popular annual lighting of the Fresnel lens will be interrupted for a few years, but California State Parks promises the lens will be returned to the lantern room in the future. Head: J.W. Patterson (1872), Richard H. Fairchild (1873 – 1875), Melvin P. Giles (1875), Edward Leedham (1875 – 1877), C.H. Howard (1877 – 1878), H.T. Holbrook (1878 – 1879), George H. Cooke (1879 – 1882), John C. Perry (1882 – 1884), Charles B. Grass (1884 – 1888), James Marner (1888 – 1896), John McKenna (1896 – 1901), John E. Lind (1901 – 1910), Carl E. Reit (1910 – 1915), John Nixon (1915 – at least 1930), Gerhard W. Jaehne (at least 1932 – 1945), Paul Fielding (at least 1948 – 1955), David L. Nimmo (1955 – 1960), James A. Hanks (at least 1972). First Assistant: J.W. Patterson (1871 – 1872), Joseph Stone (1872 – 1873), J.M. Farran (1873 – 1874), Alexander Sutherland (1874 ), Samuel Ensign (1874), Charles B. Sperry (1874 - 1875), John Munroe (1875 – 1879), Frederick Williams (1879 – 1880), John Webb (1880), Henry J. Hess (1880 – 1881), G. Polk Young (1881), John C. Perry (1881 – 1882), William H. Medina (1882 – 1883), John C. Ryan (1883), William C. Price (1883), Charles B. Grass (1883 – 1884), Henry Griener (1884), Conrad Carrolien (1884 – 1885), Frank Brandt (1885), John P. Carson (1885 – 1887), Benjamin F. Leeds (1887), Albert G. Judson (1887), Charles H. Mullin (1887 – 1888), James Nightwine (1888 – 1889), Edward Comerford (1889 – 1889), Jefferson M. Brown (1889 – 1893), Ora O. Newhall (1893 – 1898), Louis Engilbreckt (1899 – 1900), Isaac Knutsen (1900 – 1905), Andrew L. Crandell (1905 – 1907), Carl E. Reit (1907 – 1910), Henry G. Weske (1910 – 1912), Lemuel C. Miner (1912 – 1914), Fred Prussmann (1914 – at least 1924), Jesse E. Mygrants (at least 1926 – 1941). Second Assistant: George F. Patterson (1872), J.M. Farran (1873), Alexander Sutherland (1873 – 1874), Samuel Ensign (1874), Charles B. Sperry (1874), William H. Davis (1874 – 1875), Charles P. Patterson (1875 – 1876), Melvin P. Giles (1876 – 1878), George P. Brennan (1878), Eugene W. Cullnon (1878 – 1879), U. Van Wagner (1879 – 1880), G. Polk Young (1880 – 1881), William H. Medina (1881 – 1882), John C. Ryan (1882 – 1883), Manuel Machado (1883 – 1885), Charles H. Mullin (1885 – 1887), James A. Whetzler (1888), Edward Comerford (1888 – 1889), Joseph Pereira (1889 – 1890), Winslow D. Getchell (1890 – 1891), Ora O. Newhall (1891 – 1893), John A. Peterson (1893 – 1898), Joseph Pereira (1898 – 1901), Patrick J. Dempsey (1901 – 1902), Charles A. Stiner (1902 – 1903), Andrew L. Crandell (1903 – 1905), Parker J. Ashford (1905 – 1907), George F. Watters (1907 – 1908), Elihu E. Lindley (1908 – 1909), Jose Bento (1909), Lemuel C. Miner (1909 – 1912), Thomas G. Thomson (1912 – ), Fred A. Cook (at least 1913 – at least 1917), Wesley R. Fitzgerald (at least 1919 – at least 1920), Frank M. Bentley (at least 1921), Jesse L. Beezley ( – 1924), Jesse E. Mygrants (1924 – ), Harmon A. Day (1925 – 1926), August Nelson (1926 – 1927), Thomas Henderson (1927 – at least 1930), Frederick C. Zimmermann (at least 1934 – 1940). Third Assistant: P. Wheelan (1873), Alexander Sutherland (1873), C.P. Miarmontes (1873), Samuel Ensign (1873 – 1874), Charles B. Sperry (1874), Charles R. Pierson (1874), William H. Davis (1874), John Riley (1874 – 1875), William J.E. 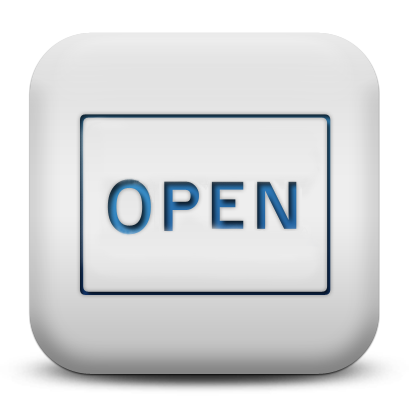 Hobbose (1875), John Munroe (1875), Peter Latour (1875), M. Van Wagner (1875), Eugene W. Cullnon (1876 – 1878), G. Polk Young (1878 – 1880), William H. Medina (1880 – 1881), John C. Ryan (1881 – 1882), Frank Billings (1888), Edward Comerford (1888), Thomas Gagin (1888), Daniel O’Donnell (1888), John B. Silveira (1888), Joseph Pereira (1888 – 1889), Winslow D. Getchell (1889 – 1890), Daniel McManus (1890 – 1891), Ora O. Newhall (1891), John A. Peterson (1891 – 1893), Joseph Pereira (1893 – 1898), Patrick J. Dempsey (1898 – 1901), Andrew L. Crandell (1901 – 1903), Parker J. Ashford (1903 – 1905), George A. Stiner (1905 – 1906), Jose Pereira (1906) , George F. Watters (1906 – 1907), J. Lee Palmer (1907), Elihu E. Lindley (1907 – 1908), Thomas Hunter (1908), Lemuel C. Miner (1908 – 1909), Albert J. Scott (1909), Perry S. Hunter (1909 – 1911), Joseph A. Sylvia (1911), Harry R. Byers (1911 – 1912), George B.R. Rogerson (at least 1913 – at least 1915), Fred J. Whitney (at least 1919), Gustaf O. Stalin (at least 1921), Norris H. Hilton (1923), Clyde A. Wylie (1924), Harmon A. Day (1924 – 1925). 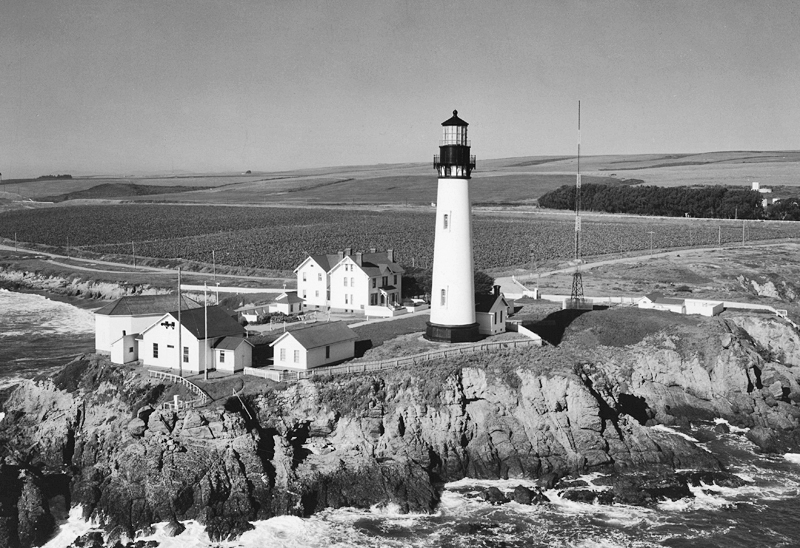 The History of Pigeon Point Lighthouse, Frank Perry, 1986. “Legacy of the Carrier Pigeon - A History of the Pigeon Point Light Station,” Frank Perry, The Keeper's Log, Spring 1999. “Lighthouse Keeper’s Child Drowned,” Daily Alta California, October 20, 1878. 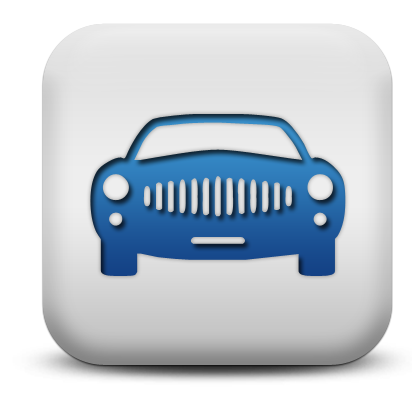 50 miles south of San Francisco and 26 miles north of Santa Cruz, next to Highway 1. 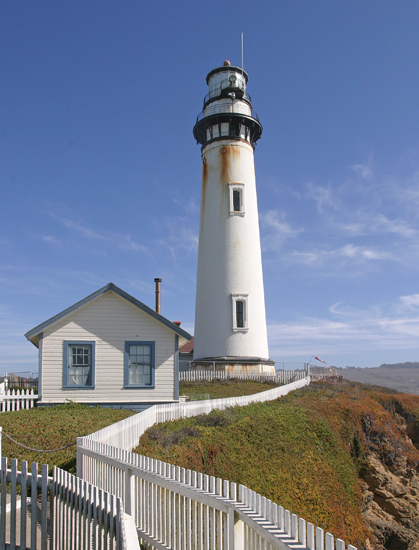 For a larger map of Pigeon Point Lighthouse, click the lighthouse in the above map. Pigeon Point Lighthouse is located 26 miles north of Santa Cruz and 20 miles south of Half Moon Bay. Clearly visible from Highway 1, the lighthouse is reached by a short drive down Pigeon Point Road. Note that the tower itself and the immediate area around the tower have been closed since December 2001, when two massive chunks of cornice broke loose and fell from the tower. 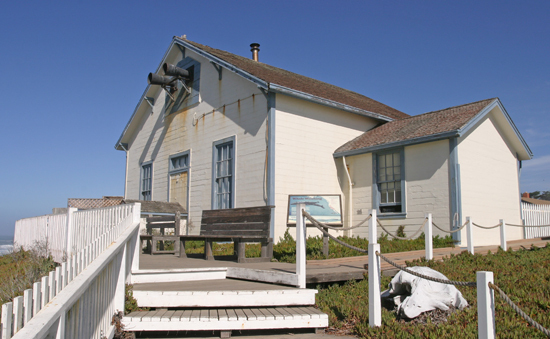 The grounds of Pigeon Point Light Station State Historic Park are open to the public during daylight hours. A visitor center in the fog signal building is open Thursdays through Mondays between 10 a.m. and 4 p.m. and docents are available during this time to answer questions. An anniversary lighting celebration used to be held every November, typically on the Saturday closest to the 15th, but this popular event was suspended after the lens was removed from the tower in 2011 and placed on display in the fog signal building. 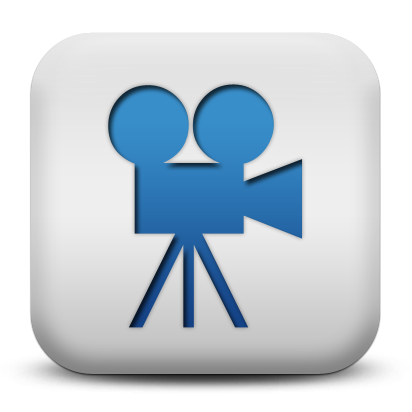 For recorded information on the lighthouse, call (650) 879-2120. 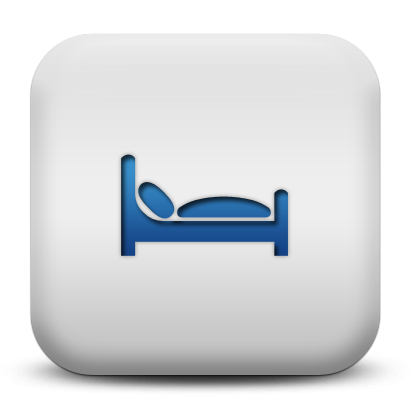 Reservations at the hostel located next to the lighthouse can be made online or by calling (650) 879-0633. The lighthouse is owned by California State Parks. Grounds open, dwellings open to hostel guests, tower currently closed. In recent years, the first-order Fresnel lens has been lit for a two-hour period during the weekend closest to November 15th, the anniversary of the original lighting. During a visit to the event in 1997, they even fired up the old diaphone fog signal, and its booming voice once again rolled out over the waves. The highlight of the evening was the moment when the lens was first illuminated. At that time, a spontaneous, collective "Ahhh" issued from the crowd, as the beams of light from the lantern room penetrated the darkness. Pigeon Point Lighthouse can be seen in the movie Final Analysis. If there ever was a seacoast designed for a beautiful lighthouse setting, this is it! Nestled along scenic Highway One, this lighthouse is one of America's tallest. It's a lighthouse made for California!